We’re getting SO CLOSE to October 6th!!! Though you can’t get the book just yet, you can take a sneak peek at what’s inside in this little trailer I made. A big thank you to Mr. Schu, who premiered it on his blog yesterday. Also, if you want to get the book two days earlier than release, you can join Elliot and me for cheesy treats at the Books of Wonder book launch party on Sunday, October 4 at 3PM! If you can’t join us, you can pre-order signed copies of both Big Family and Big City! I know summer is over, but Little Elliot and I are actually going on a family trip. A BIG FAMILY trip, that is! 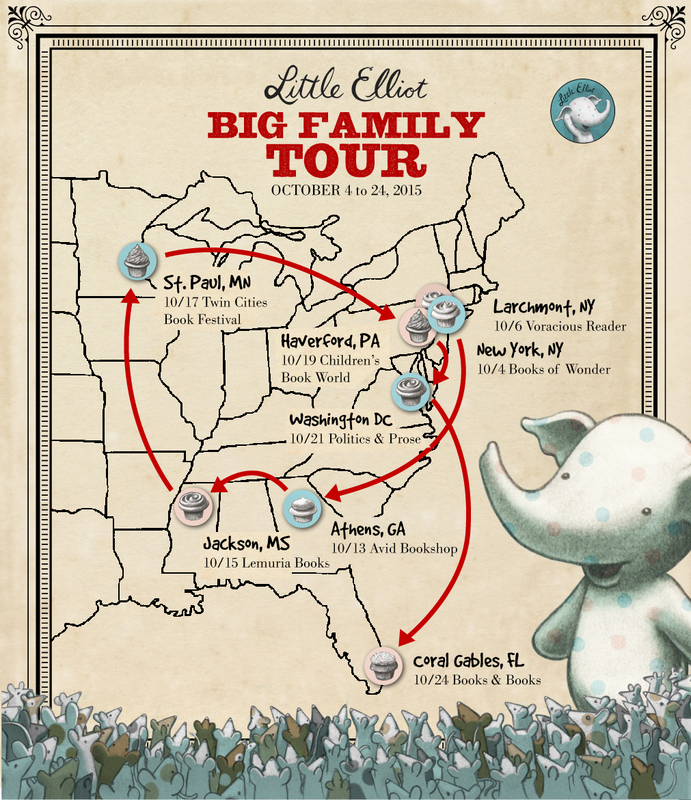 The next installment in the series, Little Elliot, Big Family, comes out Tuesday October 6th! Elliot and I will be doing some local events here in New York to start things off, then we’re off to different parts of the country to visit our extended reading family. Check out the tour dates to see if we’re stopping near you! 3 – 5 PM: Last year, we had an incredible book release party at Books of Wonder, and I’m thrilled to be back again this year. Though the book technically comes out on October 6th, you’ll be able to purchase Little Elliot, Big Family early on October 4th, enjoy some cheesy treats with Elliot, Mouse, & me, and enjoy the window display that my friends and I are cooking up! Here’s a pic of last year’s window! Click the image to read all about the making of. There are even more events in November! You can keep track of Elliot and me on my trusty events page.